the perfect meal or gameday snack! Happy Monday! My post today is part of the multi-blogger #FabulousFlatbread Challenge, coordinated by my lovely friend Rachel of Rachel Cooks and sponsored by the United Dairy Industry of Michigan. My awesome blogger friends are sharing some pretty amazing flatbread recipes, plus there are prizes! 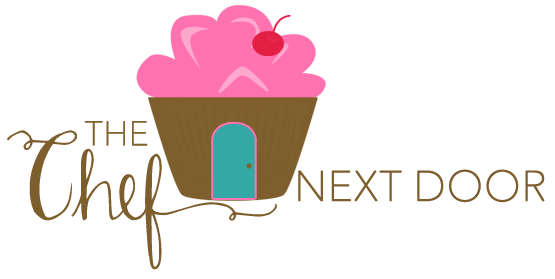 Head on over to Rachel Cooks to read all the details of the challenge, find out what prizes are up for grabs, and link up your fabulous flatbread recipe! When it came time to develop my own fabulous flatbread, I knew I wanted to do something different, something really unique. After having delicious Cuban pork at a friends open house this past summer, I was craving it again and wanted to make it at home. I created the perfect pork recipe, even made it in the slow cooker, and knew it would be an awesome base for my flatbread pizza. 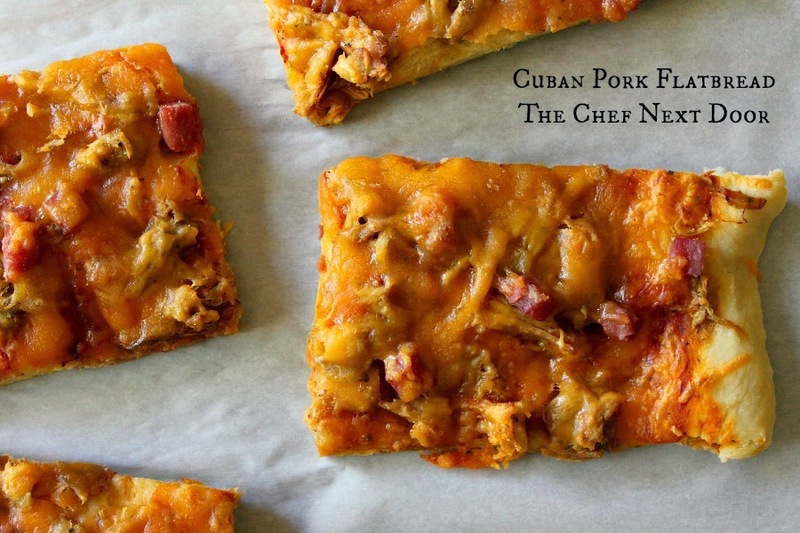 My thought was to take the filling of a Cuban sandwich and turn it into a flatbread. This doesn't have every element of the sandwich, but it does have some similarities, specifically the amazing shredded pork. The pork recipe will make more than what you need for this flatbread, and I highly recommend you make some tacos with it. We did and they were so delicious! There should be enough pork for at least two, if not three meals. You can also cook the pork a day or two in advance of making your flatbread; it keeps perfectly in the refrigerator for several days. I used a boxed flatbread mix in this recipe to save some time. I chose garlic and onion and it added a great depth of flavor to the pizza. Feel free to use a mix or, if you have your own homemade recipe, use that instead! Preheat the oven to 475 degrees and lightly grease a baking sheet. Prepare the flatbread as directed on the package. Once your dough is ready, pat it and work it on to the prepared sheet. Spread the pizza sauce all over the surface of the dough, then top it with the shredded pork, ham and cheddar cheese. Bake the flatbread for 12-15 minutes, until the edges are golden brown and the cheese is melted. In a small bowl, mix all of the ingredients together except for the pork. Rub the mixture all over the pork, covering all the sides, and set it in the slow cooker. Pour any remaining juices from the bowl over the pork. Cover and cook on low for 6-7 hours, on high for 4-5 hours. When the pork is done cooking, remove it from the slow cooker and place it on a cutting board. Shred the pork into chunks with two forks, then place it back in the slow cooker with the liquid to keep warm. Milk is a local food, produced by hardworking Michigan farm families. That means cheese, yogurt and other dairy foods are local too! Cheese is a nutrient-rich food that contains calcium, protein, phosphorus, zinc, and vitamins A and B12. When you think of getting your dairy in each day, remember that cheese counts too! Thank you to the United Dairy Industry of Michigan for sponsoring this post! I was compensated for developing a "Fabulous Flatbread" recipe using Michigan dairy products. As always, all opinions are my own. UDIM is the umbrella organization for the American Dairy Association and Dairy Council of Michigan. 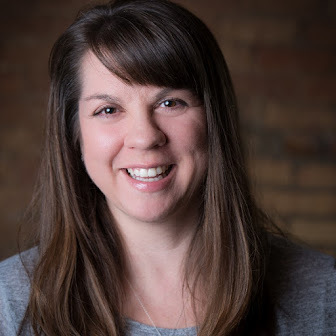 Their goal is to promote Michigan’s locally produced dairy products and reconnect consumers with the people behind their food. For more great dairy recipes, follow UDIM, branded as Milk Means More, on Pinterest. To learn more about nutrition, animal care/well-being and on-farm practices related to dairy products and the dairy industry, you may want to follow Milk Means More on Facebook. You can also follow them on Twitter and YouTube!